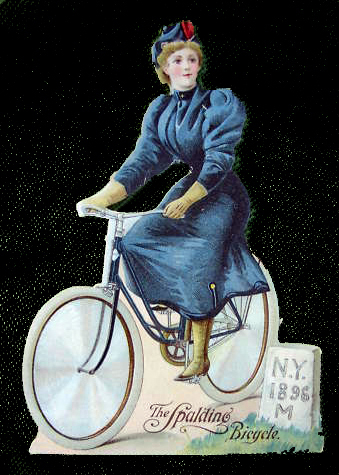 The 1898 Columbia catalogue below illustrates two models of Christy saddle, the Christy No 9 Lady’s saddle, which is identical to those pictured here, and also the Christy No 3 Men’s saddle with an extended front part. 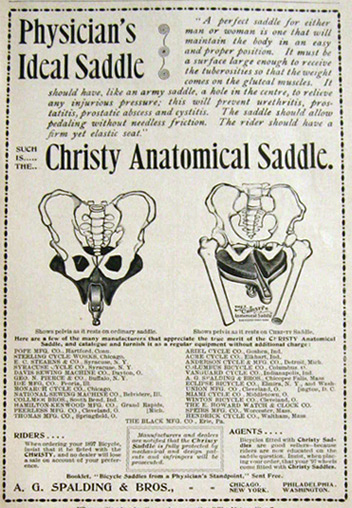 Christy (and other anatomical) saddles were heavily marketed by 1898, and Columbia offered them as an option. 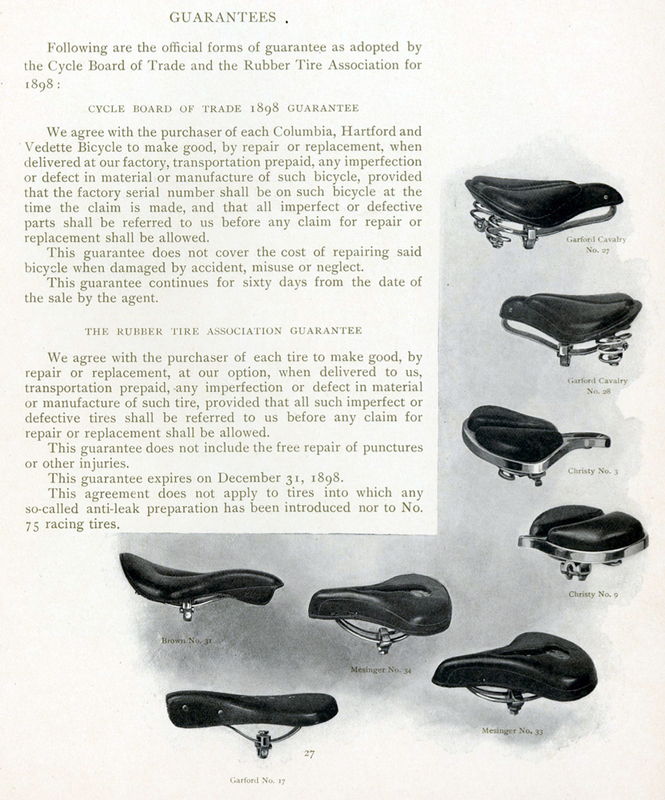 [When we look at old bicycle catalogues retrospectively, especially over a century later, it’s easy to assume that a customer’s choice was limited to the options described. But that was not the case: customer satisfaction was much more important then than it is now; as long as they willing to pay, customers could choose any option, even components from a competing company]. 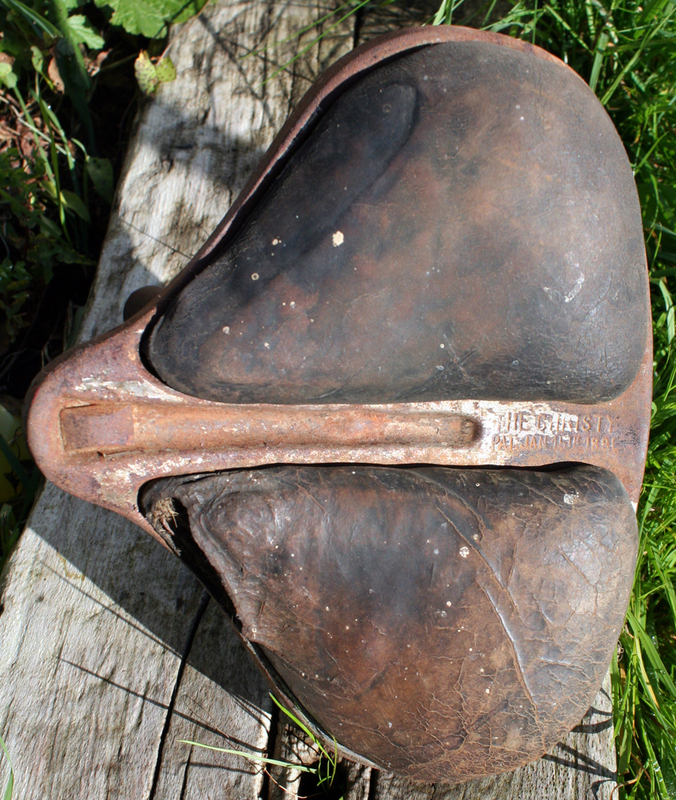 For reference, I’ve attached these two photos (above and below) of a Christy No 3 Men’s saddle that sold on American ebay. 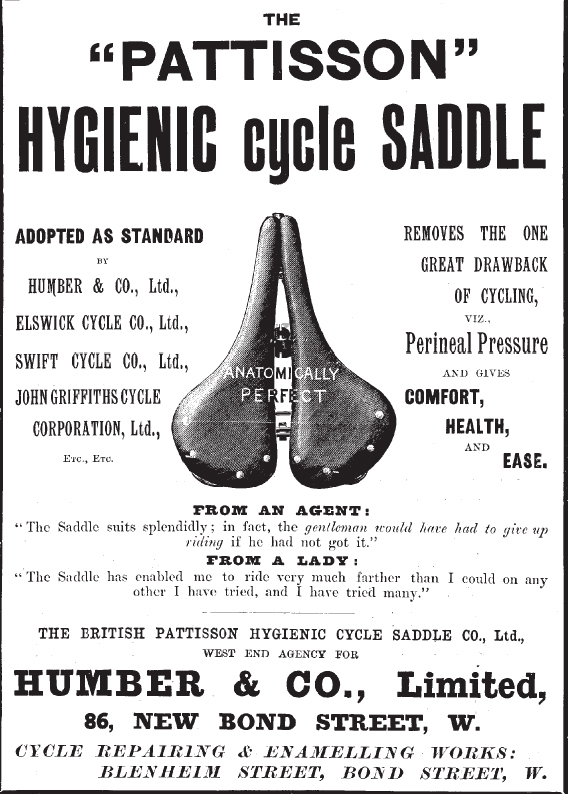 EVERY SADDLE GUARANTEED TO GIVE SATISFACTION. CANNOT GET HOT. PERFECTLY VENTILATED. ACTION OF THE LEGS, AND AN EASY MOTION IN EVERY DIRECTION. 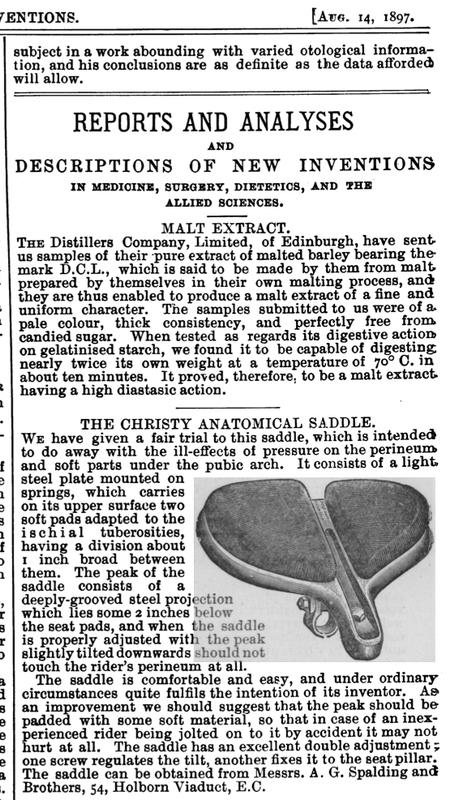 It’s easy to see, of course, with the benefit of hindsight, that ‘scientific’ reasons behind the design of the anatomical saddle are somewhat suspect. 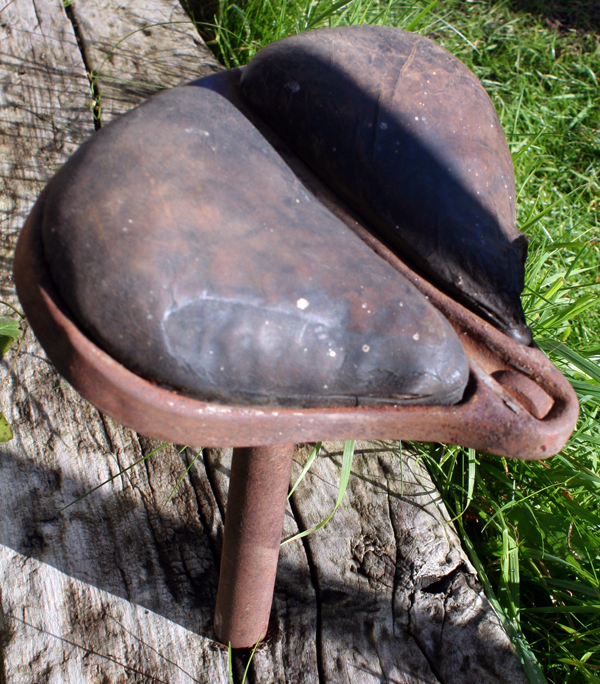 It looks like this alternative saddle concept was boosted by a well thought-out advertising campaign. 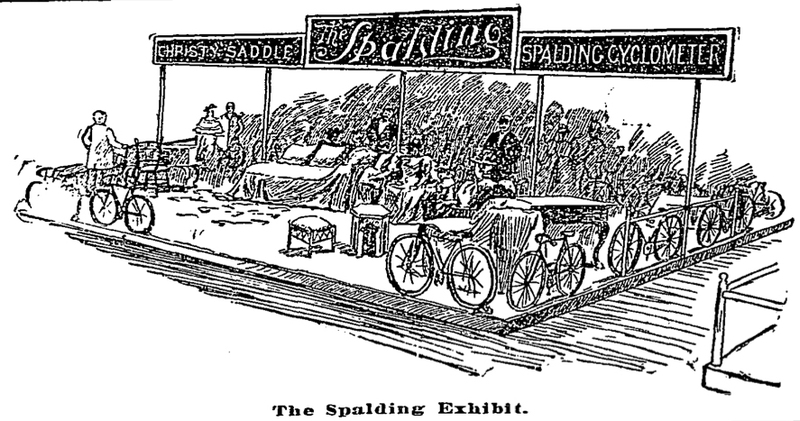 But ‘scientific’ claims were an important advertising medium in the Victorian age. 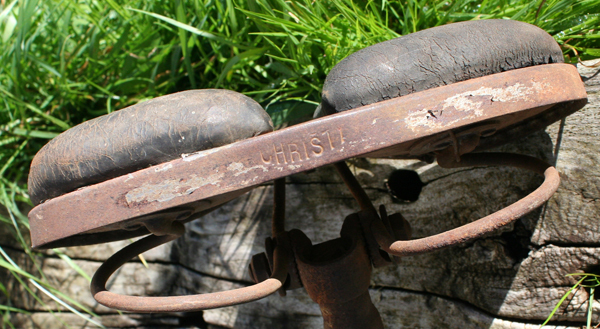 Science was still new. Future big corporations such as Coca Cola were founded then, usually making their fortune from simple products boosted by a prominent campaign created by a newly-empowered advertising industry. When it came to selling ideas to the public, there was often a thin line between science and pseudo-science. 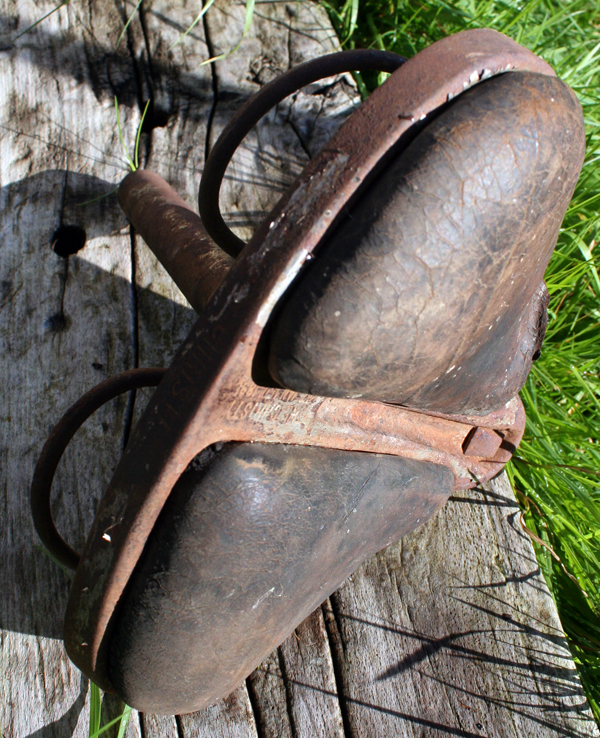 For example, a ‘cure’ was found for the ‘disease’ known as beri-beri, which greatly afflicted European settlers in south-east Asia. Dutch military doctor Christiaan Eijkman accidentally discovered that the cause was in the Europeans’ diet. Instead of eating the local brown rice, they ate white rice, with the nutrients polished out of it. The ‘cure’ was therefore simple: eat nutritious local food, not the usual European diet of white rice, white bread, etc. Japanese naval surgeon Kanehiro Takaki came to the same conclusion in 1884. But that explanation was not accepted. A ‘cure’ was required. It was many years later, in 1911, that scientist Casimir Funk isolated an anti-neuritic substance from rice bran. He named it ‘vitamine.’ The multi-billion dollar vitamin industry was born from that product. In other words, people were sold polished white rice as ‘rice’ and then required to take vitamin supplements because white rice has no nutritional value. All this because unpolished brown rice could not be stored anywhere near as easily, and long-term storage (including grain transportation for long sea voyages) was important to the food industry. 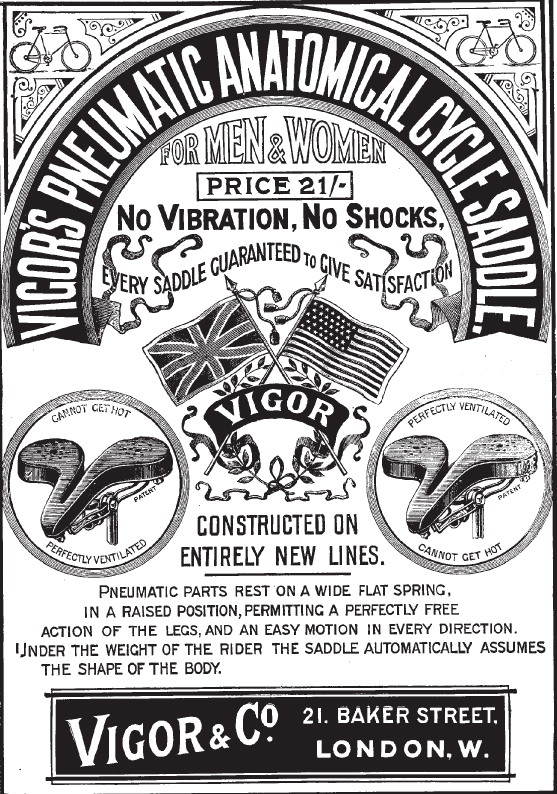 Science is still used in advertising campaigns to sell specious concepts to a gullible public, and it’s interesting to see this early example.